When last I wrote about the impact of my community theater habit on my family, I’d just finished up work on a musical that included my husband in the cast, rendering our children parentless nights and weekends for a couple of months. Which was totally fiiine. At least that’s the way I remember it. I have really good amnesia skills, though, you can tell because I have more than one child. 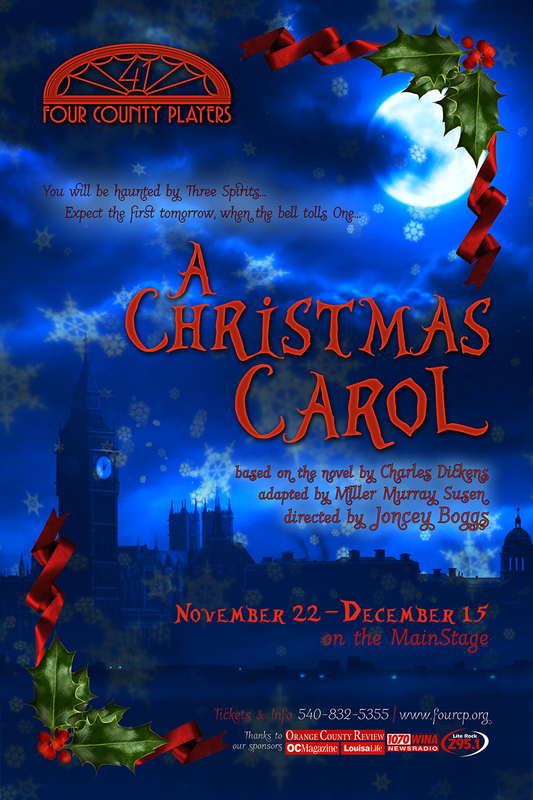 Anyway, this fall I had the opportunity to work with a director friend who asked me to adapt and assistant direct Dickens’ A Christmas Carol. The project intimidated me, and that made me mad at myself, so I had to do it. The director also expressed interest in seeing my nine year old for a part. My daughter had already asked if she could audition for something, and having her come to rehearsals I’d have to attend anyway would certainly be convenient. Moms and girls, learning together! Mass hysteria! Sign us up. First, I cobbled together an adaptation, learning a tremendous amount in the process. I may not have time or money for a formal playwriting education, but I do have tolerant friends willing to let me learn on the job. Then, my daughter auditioned and was cast. When my husband came to pick her up, we asked him to jump up and do a cold read of Scrooge’s nephew, Fred. And he nailed it–ugh, he’s so annoying–so he was in. The director and I decided it would be best for me to play Ghost of Christmas Future because it’s a lot of driving just to point ominously. And gosh, the thought of our six year old home by himself with a sitter while his WHOLE FAMILY did a play together was so heartrending that, against my better judgment, I asked the director if she’d mercy-cast him in a small role, which she graciously did. BAM mostly by accident we were all in a play. Upside? No need for babysitting. Downside? No need for babysitting. Our A Christmas Carol opens on Friday, so right now we’re inching our way toward the tippytop of that first big hill on the rollercoaster. Reminds me of this past summer when I rode the Grizzly at King’s Dominion with my six year old. I turned to him afterwards expecting him to be limp with laughter, and instead found a pale, quivering mass literally speechless with fear. Trying to say that at this point it could really go ANY WHICH WAY, y’all. Here are a few impressions of the process so far. 1. As a couple, it’s hard to parent together, it’s hard to work together, it’s hard to work AND parent together, PLUS parent people who are working on the same project. Is all I’m going to say about that. My husband LOVES to be directed by me. Oh, look, I said something else! 2. As a parent, it’s hard to parent, it’s hard to work and parent, it’s hard to parent people who are working hard, PLUS work hard yourself on the same project. It’s kind of cool to have my kids know me in this very adult realm and different context, and it’s also kind of weird. And now they know for sure that I know a lot of swear words. 3. Needing less babysitting is nice. But I’ve still needed babysitting, and constructing and staffing a schedule that accommodates four different rehearsal calls, plus other after-school activities, plus Husband’s intense work travel schedule, plus my other work, (both paid and volunteer), has been… Well. I don’t consider organization to be a natural strength, so it’s been LIKE THAT. 4. I am a lunatic about kid dinner and kid sleep. Since the typical rehearsal schedule runs four weeknights and a weekend afternoon or evening per week, I had some major Fun Police anxiety about involving the kids in this play. It hasn’t been as bad as I feared, actually, but here’s an anecdote from Sunday’s tech rehearsal. It’s 8:45 pm. We’re working on the finale with lights and sound. My six year old doesn’t enter when he’s supposed to. The stage left Stage Manager calls out that she can’t find him. The stage right Stage Manager replies that he’s asleep on a bench on her side. She rouses him, he finishes strong, we get in the car to go home. 6yo: “Did NOT I was AWAKE!” Etc. etc. etc. Obviously I can’t draw conclusions about this experience before it concludes, and I’m sure I will feel many different flavors of things even then. One thing I know, though, is that this was a special and unique adventure I’m proud of our family for undertaking. And another is that I will be wearing my extra-super waterproof mascara on opening night. ← Make time. Take time. Find time. A glimpse inside. Thx, Miller Time.